She Wolf Night: Are dragons a memory of dinosaurs? Some people believe that this is a throwback memory of prehistoric times. Early mammals were present during the dinosaur era. There wasn’t any evidence of humans living at the time of the dinosaurs. Another point is that there are theories to suggest that we have strong memories, passed down from our ancestors. Hereditary memory. It’s not fully researched yet. If this is the case, and hereditary memories are real, they could explain a lot. That may cause us to wonder how far back in time these memories stretch. Would they go back to when our own ancestors lived during the Ice Age? What about long before then when our common ancestors were just hunters and knew mammoths? I’m sure this may be it, guys. Hereditary memory about Ice Age mammals have sort of given humans the idea of certain monsters and beasts. In Greek mythology, a cave belonging to a giant cyclops had in recent years, been found to have fossils of woolly rhino and other Ice Age animals. How did people from the Ice Age get to hunting and risking their lives with beasts to ancient Greeks with their cyclops? Could these beasts be fragmented, unexplained memories distorted with visions of fear? I guess mammoths were frightening and wonderful but awesome. How did our ancestors find them? I guess they might’ve had feelings of respect and fear. Possibly saw them as food. Either way, their memories of the mammoths would pass down though thousands of years. To the time of the ancient Greeks, the descandants of those Ice Age hunters would not remember what mammoths were or looked like. But they would carry the fear of something enormous and powerful with giant horns. Is that small mammal creature able to pass down vivid memories of dinosaurs to us modern humans? It sounds unlikely and stupid but is it? Where did the dragons come from? Surely they were real? or were they dreams? Or dreams and real both combined? Yes, a time of the dinosaurs was real, and early human ancestors that looked like this had coexisted with them. But what about all the stories and legends of dragons? Where did that come from? I have an idea that may be spiritual other than physical. Dragons could be the spirits or spirit guides of the deceased dinosaurs that were seen by people throughout history. Obviously modern humans have lost the ability to see things. Perhaps dinosaurs didn’t all get wiped out 65 million years ago. Perhaps some survived and became our dragons. End of post by Rayne Belladonna. 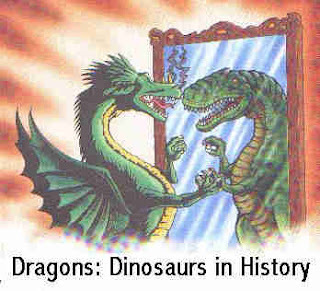 (On further thought, dragons might've been surviving species of dinosaurs, maybe a very altered and magnificent type that breathed fire). Anyway, if humans didn't live at the same time as dinosaurs, why are there cave paintings of dinosaurs that were made by prehistoric humans?